Insufficient number of red blood cells or the amount of hemoglobin in the blood is called anemia. The most common symptoms of anemia include fatigue or lack of energy, tired, and susceptible to colds and other infections. There are many different causes of anemia. Anemia may be caused by illness or loss of blood. In this article we will discuss only the anemia caused by iron deficiency. Anemia due to iron deficiency caused by lack of food that contains enough iron. Iron is a mineral found in nature and when consumed through fruits and vegetables, are used by the body to manufacture hemoglobin. In treating iron deficiency or anemia, your doctor may prescribe a multivitamin that contains iron. But in general, the intake of foods that contain iron along with adequate rest anemia will return to normal conditions. This fruit contains iron which is perfect for ensuring the body gets iron intake. .
Beet greens are a source of vitamins A and B2. Beet greens can also enrich the blood with iron and manganese. Chard is a vegetable that contains vitamin A and iron. Corn is rich in iron and copper. Maize is also a good source of vitamins A and C.
Eggs are rich in all minerals, including iron, and vitamin B. Ideal eggs consumed at breakfast because it contains a sufficient amount of energy. Watercress is an excellent source of vitamin A and vitamin B and C. Watercress contains high amounts of iron, calcium, and potassium. Molasses provides an excellent source of iron for anemia. Raisins contain iron which is very high. Raisins are also a food that is alkaline and can help the body cope with the acidic conditions. 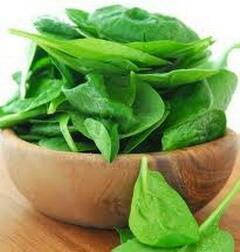 Besides iron, spinach also contain vitamin A. Spinach should be a routine part of everyone's diet. This nut is very rich in iron and can increase blood flow in the body. One ounce of almonds a day provides 6% of your iron needs every day.